The Grand Canyon is one of the most breathtaking places in the world. As an insight into the raw power of nature, it acts as a beacon, drawing people from all over the world. Unfortunately, the popularity of the Grand Canyon as a tourist attraction often means that viewing it on the ground can be quite a crowded experience. Luckily, visitors can choose a different option to see all the wonders of this unique landscape. With a helicopter tour, adventurers can take to the sky and experience the thrills of the Grand Canyon on the most epic scale imaginable. We also offer numerous airplane tours. Here are a few of the many reasons we recommend you see the Grand Canyon from the sky. 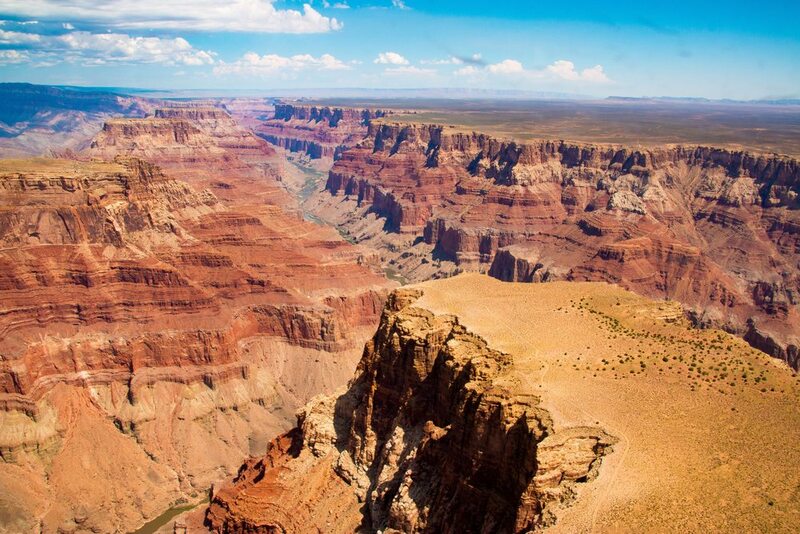 Perhaps the most obvious reason to explore the Grand Canyon from the air is that it allows you to view all the most incredible parts of this stunning rock formation from a perspective that only the lucky few can enjoy. From the sky, you can see landscapes in a context impossible to enjoy from the ground, gaining a new perspective on the sheer scale and depth that the Canyon possesses. In a helicopter, visitors can discover the way the Colorado River snakes through natural formations of rock as the sun beats down on the scenery below. In addition to a better understanding of the scope of this natural treasure, helicopter tours offer a truly unbeatable view. Unlike other options for aerial touring, such as hot air balloons, helicopter tours over the Grand Canyon allow visitors to see more of their chosen destination in a shorter amount of time. While on the ground you might have to choose between peering down into the Grand Canyon or exploring the vivid colors of the Valley of Fire, for example. With a helicopter tour, you can do both. Rather than rushing from one location to the other, struggling to push your way through crowds and overlooking the majesty of the views available, explorers can sit back, relax, and enjoy the scenery. With a glass of champagne in one hand and a camera in the other, you can get the VIP view of Arizona. Speaking of sipping champagne, every aspect of a helicopter tour focuses on giving you the ultimate VIP experience. In the past, helicopter flights were a staple of the rich and famous, but now this amazing experience is available for everyone. The beauty of your own private helicopter tour is that the adventure revolves entirely around you. When you step into a private helicopter, you can expect the comfort that comes with knowing you have a professional pilot with you every step of the way. As you sink into the comfortable seats of your air-conditioned cabin and sip on the bubbly that’s provided, you’ll feel very far from the crowds below. Unlike on the ground, where your views of the Grand Canyon are limited to what’s available and how big the crowds are, a helicopter tour allows you to choose your own experience by choosing the tour that best suits your desires. Perhaps you want to get as many sights into your day as possible, or maybe you’re looking for a flight that will take you right down to the floor of the Canyon itself. There are plenty of different ways for you to enjoy the views that the Grand Canyon has to offer — all without having to wait in a single line. Finally, regardless of where your helicopter tour ends up, you can rest assured that you’ll arrive at your destination in style, tingling with the knowledge that you’ve seen views other people might only dream of. No matter which Grand Canyon tour you choose, you’ll step off the plane at the end of your flight with memories that will last a lifetime. The Grand Canyon is the perfect place to discover the true value of a helicopter tour. When it comes to exploring the most incredible sights on Earth, there’s nothing that comes close to the beauty and magic of an aerial view. Don’t you think it’s time you book your own Grand Canyon helicopter tour?